Reagents needed for this experiment. 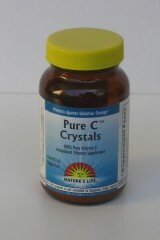 Pure vitamin C powder is pretty easy to find, at health food stores and some grocery stores, but you can also use vitamin C tablets, containing a total of 1000 mg. If you use tablets, mash them up completely in the water, to dissolve them as much as possible. Many tablets will contain some insoluble materials that will not dissolve. You can filter these off if you like, but this should not be necessary. Avoid using "flavored" or "chewable" tablets, which may contain additional ingredients which could interfere with the reaction. This solution does not keep well, so it needs to be prepared fresh. The total amount of the solution is not critical, the main thing is to prepare a 25% by weight solution, and this only needs to be very approximate. Stir the mixture well, the starch is very viscous and needs stirring to mix well. The result is a somewhat cloudy solution. 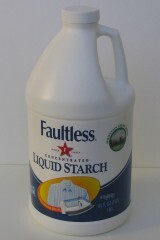 I bought "Faultless" brand concentrated liquid starch at the HEB in Austin, TX. Optional: If laundry starch is unavailable, an alternative can be prepared by mixing 5 grams of cornstarch with 30 mL of cold water until a thin suspension is formed. Pour the suspension slowly into 500 mL of vigorously boiling water with stirring so that the boiling does not stop. Allow it to cool before use. 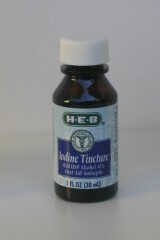 Purchase some 2% iodine tincture from the grocery store. I bought mine from the HEB in Austin, TX. Make sure to use 2% iodine tincture, which contains 2% iodine and 2.4% sodium iodide. There are other things with similar names available, e.g. "colorless tincture of iodide", these are not suitable. Tincture of iodine is flammable and poisonous. It may be a good idea to wear gloves when pouring it to avoid getting brown iodine stains on your fingers. You may be able to remove any iodine stains with vitamin C solution. 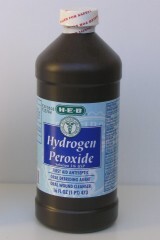 Purchase some 3% hydrogen peroxide from the grocery store or drugstore. I bought mine from the HEB in Austin, TX. 3% Hydrogen peroxide can irritate the skin and eyes. 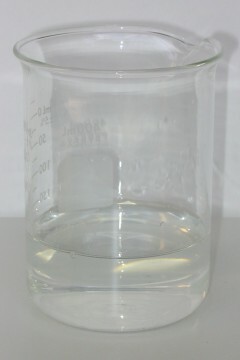 The brown color of the iodine solution will disappear when it is added to the vitamin C solution, and the result is a clear, colorless solution. Solutions A and B before mixing. Pour solution A and solution B into a separate container, and swirl or stir a little to mix them thoroughly. At first, the mixture will remain clear and colorless. After about 30 seconds, however, the mixture will suddenly turn vary dark blue, almost black. The mixture soon after combining A and B, and then after the color change. Add vitamin C to the blue-black solution until it turns colorless, then flush down the drain with plenty of water. Any excess of the starting solutions can be poured down the drain with water. When Solution A is prepared, the brown colored iodine is reduced to colorless iodide ion by ascorbic acid, according to reaction 1. This does not consume all of the ascorbic acid, however. When solutions A and B are combined, iodide ion is oxidized back to iodine by hydrogen peroxide in acidic solution, according to reaction 2. As soon as iodine is formed, however, it is reduced back to iodide ion by the ascorbic acid still present. Reaction 1 is faster than reaction 2, so very little iodine builds up, and the mixture remains colorless. Eventually, however, the ascorbic acid is exhausted. When this happens, iodine begins to accumulate. The iodine then reacts with iodide ion to form triiodide ion, according to reaction 3. This triiodide ion forms a very dark blue complex with starch, according to reaction 4, which results in the color change. 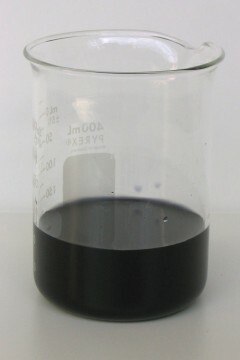 Until there is a significant concentration of iodine, the equilibrium of reaction 4 lies far to the left, and no blue-black color is observed. Varying the amount of water used in the solutions affects the concentrations of the reactants, which affects the rate of the reaction, and thus the time required for the ascorbic acid to be exhausted. 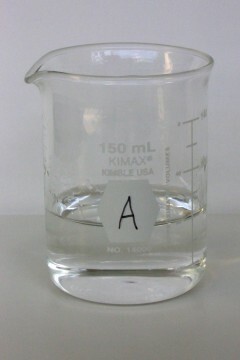 This experiment requires that there is an excess of ascorbic acid (compared to iodine) in solution A, and an excess of hydrogen peroxide (compared to ascorbic acid) in solution B, so that ascorbic acid is eventually used up, allowing iodine (and then triiodide ion) to accumulate. 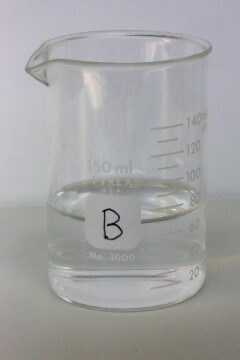 Varying the amount of water used to prepare solution A and solution B will change the time that elapses until the color change. With less water, the reaction happens faster, and with more water it happens slower. Using 30 g of water in both solutions A and B (instead of the specified 45 g) should result in a color change in 20-25 seconds, 60 g of water should result in a color change in 40-50 seconds, while 120 g of water should result in a color change in 80-95 seconds. Variations in temperature would also affect the time delay until the color changes. Tap water may not be adequate for this reaction, if the pH is too high, so distilled water is preferred. It should be possible, however, to use 5% white vinegar in place of distilled water. If you do not have an adequate scale, it may be better to use a vitamin C tablet instead of the powder, so it can me measured more accurately. (The bottle will specify the mass of vitamin C in each tablet.) Otherwise, the powder is preferred. Yes! This procedure was specifically designed so that it could be done with chemicals you can find at the grocery store. It is very useful to have a decent weighing scale. You can find pocket electronic scales for around $75, accurate to 0.1 g, either online, or (at so-so prices) at, umm, 'adult novelty' stores. Alternately, I have found an electronic postal scale, accurate to 1 g, for $25 at an office supply store. An accuracy of 1 g is not very good for chemistry, but you could get by with it. I did this experiment using glass beakers, which are also fairly easy to find, but you could use kitchen glasses if you wish. Wright, Stephen. W. Journal of Chemical Education, Vol. 79 No. 1 January 2002, pp 41-43, 40A, 40B. "The Vitamin C Clock Reaction". - This experiment is basically exactly the one in this paper. This experiment is one of several that Stephen Wright has developed that can be done with consumer chemicals. Shakhashiri, Bassam. Z. Chemical Demonstrations, Vol. 4; University of Wisconsin Press: Madison, WI, 1992; pp 3-7. Discussion of clock reactions in general, as well as several specific types of these reactions.